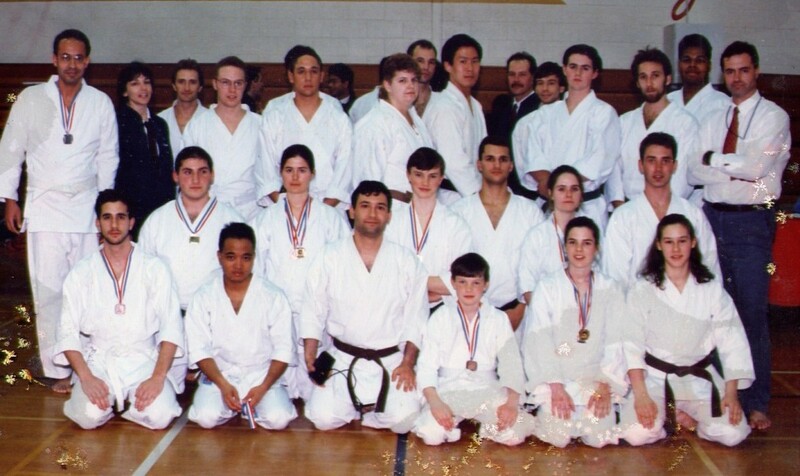 UConn team at the Montreal Tournament, March 1994. Front row: Mike Carpini, Arnold Dayap, Kaarlo Moran, Ryan Jacobs, Tanya McPhee, Kathy Kline. Second Row: Jason Morrill, Lynn Hubbard, Mike Jacobs, Bako Bakoledis, Julie Westmoreland, Jim Colandrea. Third Row (standing): ?, Matte Thomas, Luigi Piotto? (Boston), ?, ?, Julie Sorenson, Geoff Madeiros (Boston), John Cummings, Mark Blake, John Sucec, Chris Belliveau, Tom Fabian, Jim Fletcher, Bob Jacobs.